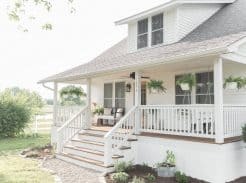 Step inside for a farmhouse fall home tour. 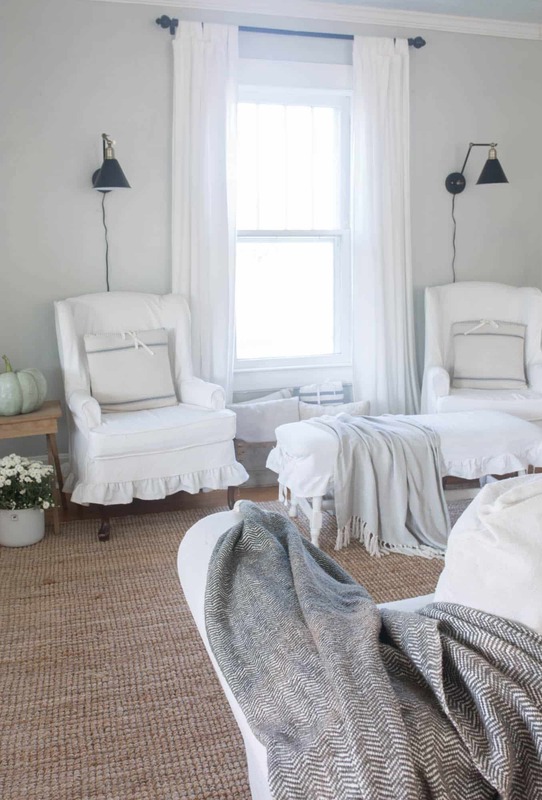 Cozy textures and soft colors keep our home neutral and natural this autumn. 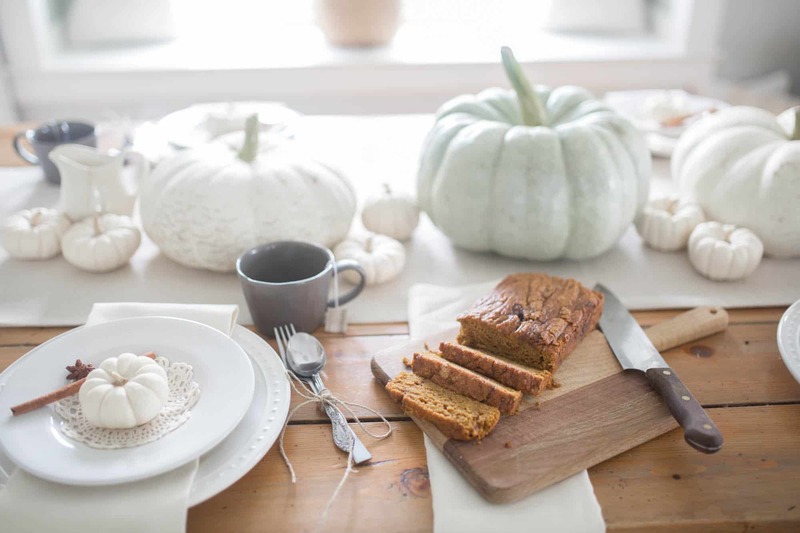 I’ve teamed up with 25 of my favorite bloggers, and Kirkland’s, to bring you all the autumn inspiration you’ll need in your home this season. If you’re coming over from Town and Country Living, welcome! I’m so glad you’re here. Read all the way to the end to enter to win a $1500 gift card from Kirkland’s! 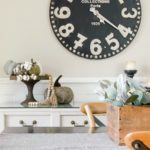 In my farmhouse fall home tour, I kept everything simple and neutral. I kept the colors soft and cozy. 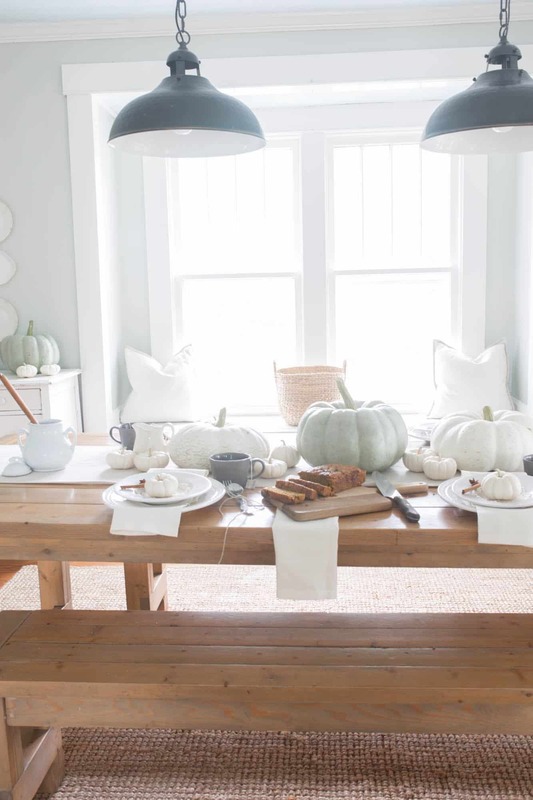 Pastel pumpkins, neutral dishes and natural textures make the space warm and inviting. I mixed in antiques and wood tones. These gray clay mugs look uneven and handmade. I love the texture they add. I found the crocheted doilies a few weeks ago at an antique shop. 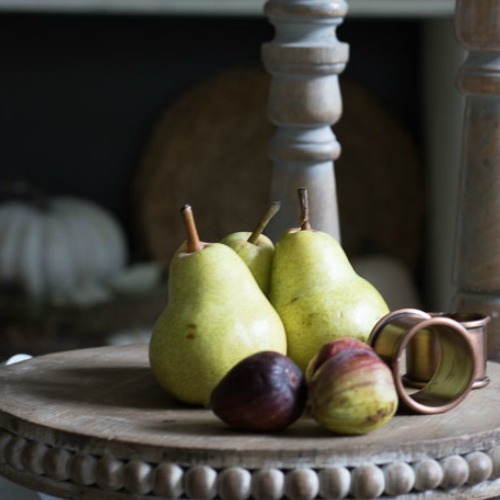 They are perfect for the fall dining room table setting. Anything made of yarn adds a touch of cozy in the cooler months. The Natural Trim Ivory Pillows from Kirklands in the window seat have a textured knit detail that make them feel warm and cozy. 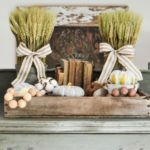 Jute and wicker are favorite natural fibers of mine in any season, but they feel especially appropriate in the fall. Antique ironstone plates bring a little detail to the walls, without without adding clutter. I added cinnamon sticks and star anise to the place settings. What says fall like autumn spices? Plus, these two are just so pretty. When I saw them in the bulk spices at my local produce stand, I knew I would incorporate them somehow! The chair in the corner was a recent thrift shop find. You can read all about how I transformed it HERE. Our family area and dining area are actually in one big room. The large natural fiber rugs help to define them as two distinct rooms. I also use the couch to separate them. I recently sold my slipcovered love seat and replaced it with two wingback chairs. You can read how I made the slipcovers HERE. The window is no longer blocked by furniture. Hallelujah for unhindered natural light! On the built ins, I brought in some antique crocks I picked up recently at the thrift shop. My motto for my fall home tour this year is clearly texture, texture, texture! I love these boxwood topiaries I found at Kirkland’s. They add in just the right amount of color to my neutral family room. 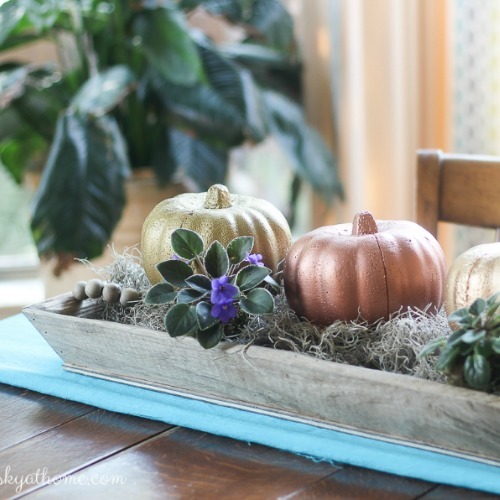 A few white baby boo pumpkins look pretty in my wood tray from Kirkland’s. They add a little autumn to the built ins. This post was sponsored by Kirkland’s. Next up on the blog hop is my friend Sarah from Flat Creek Farmhouse. Head on over to see her beautiful home all ready for fall! 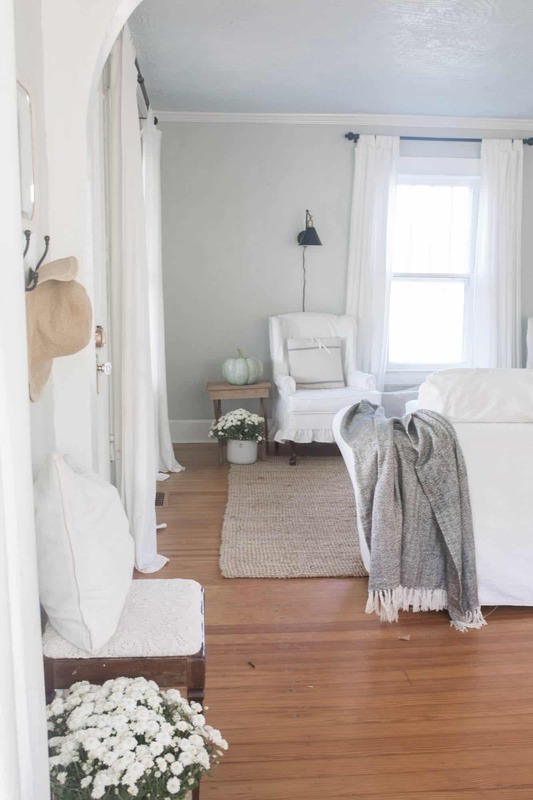 Lisa, I love your use of texture and soft colors throughout your pretty home. Love that three-sectioned wood bowl from Kirkland’s! Lisa, your home just looks so cozy and comfortable – I simply adore it! 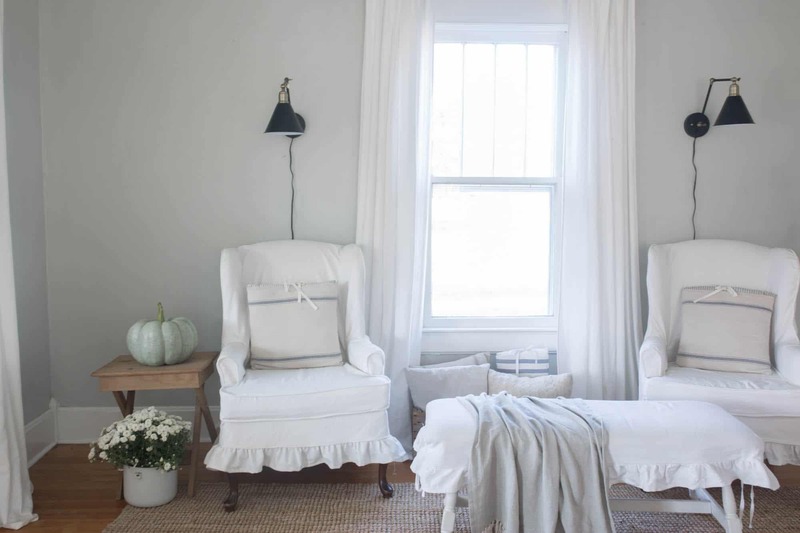 I love those pillows you scored from Kirkland’s, they are the perfect touch to your window seat. 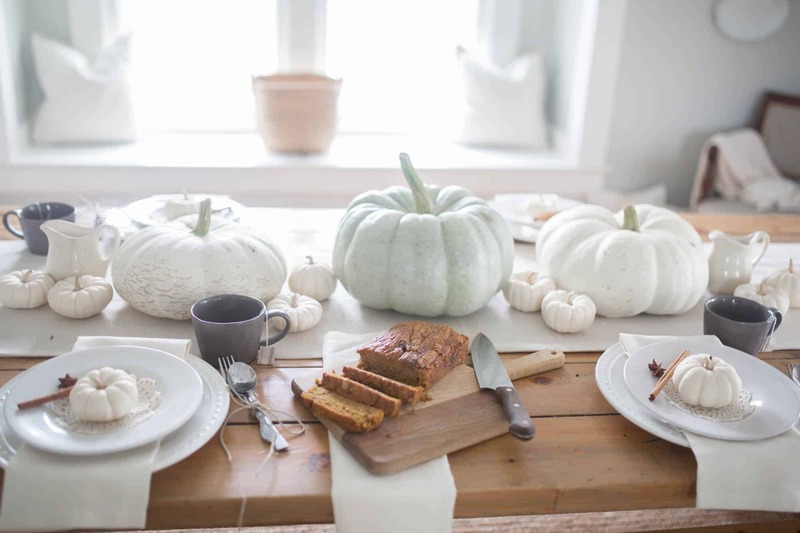 Your home looks beautiful for fall! Thank you so much Jenna! I love the pillows. 🙂 . I can’t wait to see what everyone else found, also! You do neutral so beautifully…and the fall touches are perfect! 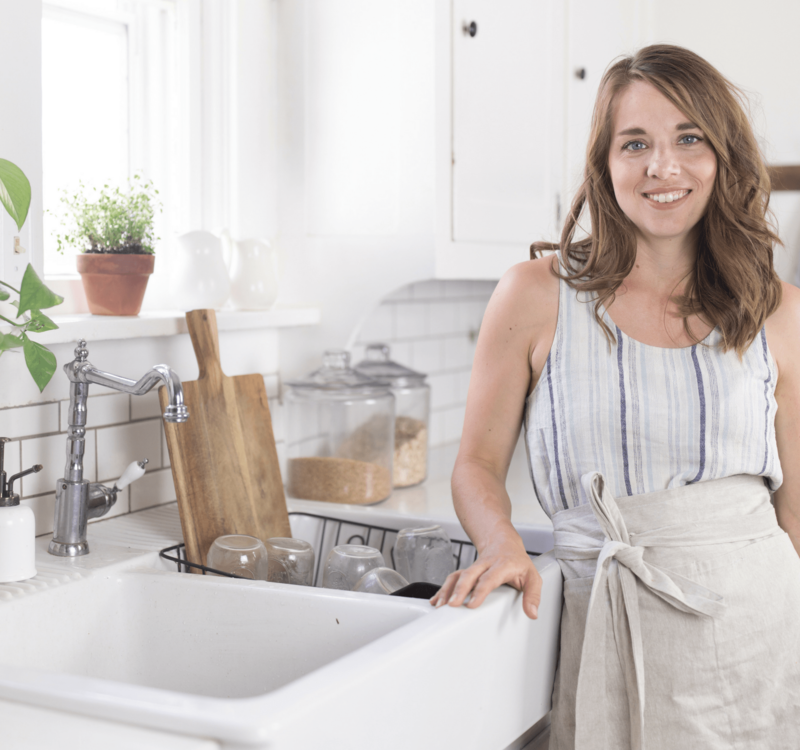 As always, your home tour is beautiful! Your slip covered chairs turned out beautifully! Love it all! Your home is beautiful! 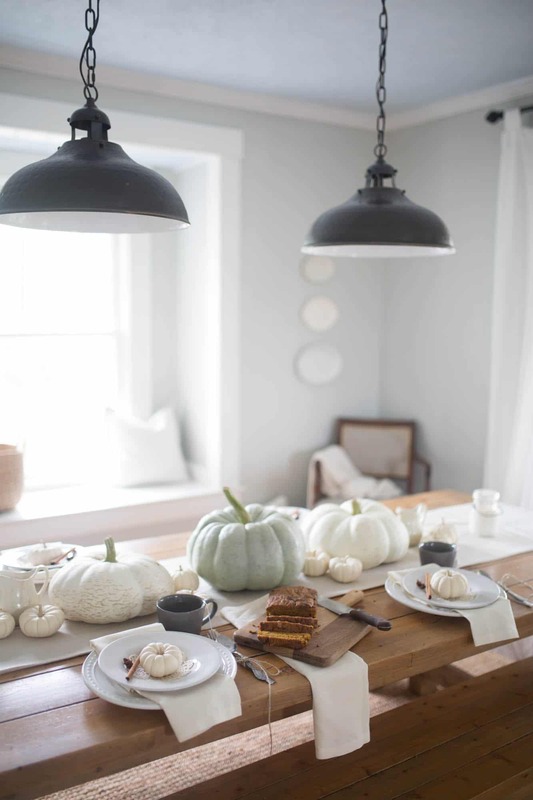 Love all your white pumpkins and your simple decor. Gorgeous! Happy Fall! Beautiful tour! 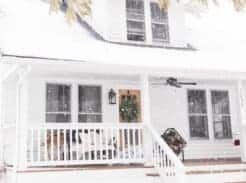 I love how white and bright and farmhousey everything is!! Pinning! Lisa, your soft cozy home is so inviting. I love all your use of neutral pumpkins to invoke fall in a subtle way. 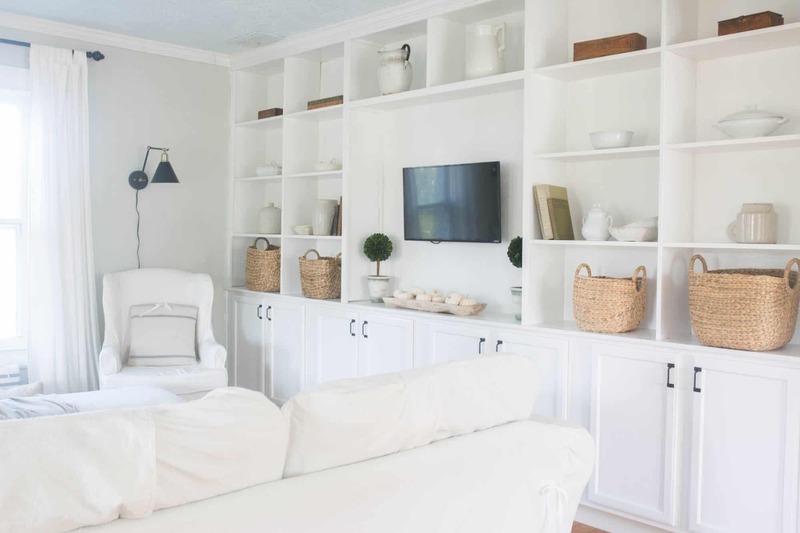 Love the bookcase with the white ironstone. Happy to be on the Fall Home tour with you. Thank you so much Carol! I can’t wait to see your beautiful tour! 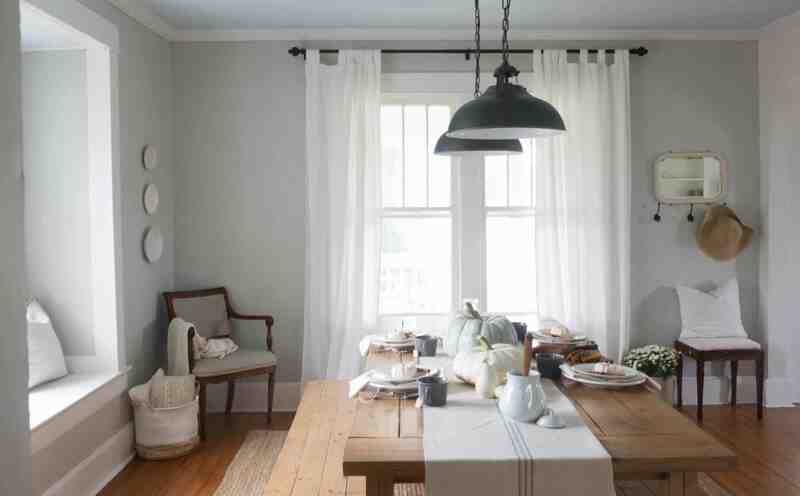 Lisa – you home already is beautiful and I love love love how you styled it for this fall! Gorgeous my friend! Pinned and sharing! Awww thanks so much for your support, Jen!! I fall more and more in love with your beautiful home each time I “visit” it! SO beautiful! That is so sweet to say! Thank you Kristi! Always love you simple style, it is so elegant, love coming over today! oh Lisa, I love your home! 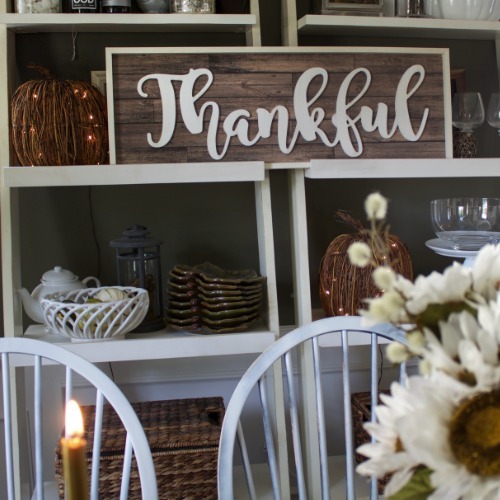 Your Fall decor is so pretty and casual. I want to come hang out and relax there! Thank you so much Leen! Classic and beautiful! Love your use of nature!!! Thank you so much Courtney! So fun doing this hop with you! So pretty Lisa…you’re a talented girl and I love it all! I am in love with the light and bright feel of your home! I am also obsessed with your pillows! And those wingback chairs are amazing! I love your pretty serene fall colors and textures! 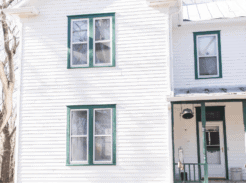 Your house is so warm and inviting! That tray from Kirklands is really beautiful. Oh my goodness, your home looks so welcoming. 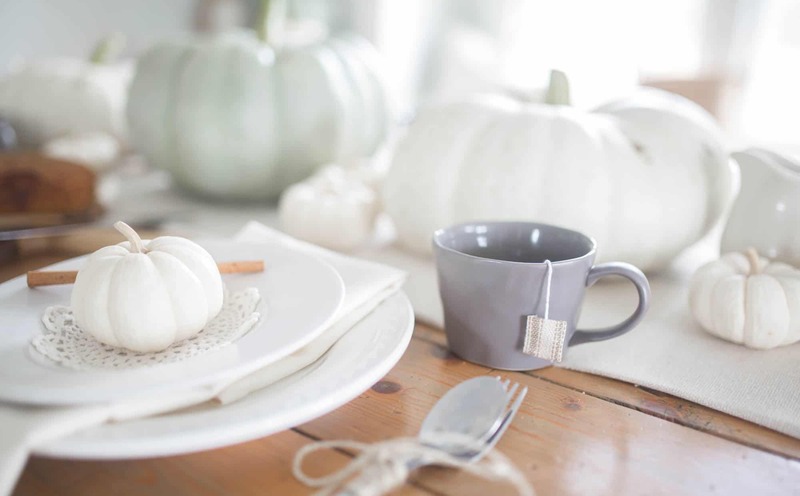 I love the neutral colors and all the white pumpkins and comfy throws. Pinned! The whites and the texture of the jute goes very well together! I love the feel of your home. Stunning home! I just love your living room – very bright, stylish and cozy at the same time. Really inspiring pictures, thank you for sharing them with us! What color is your family room painted? Beautiful as always! Love the simplicity.